One of my favorite people as of late, is Kathryn Maroun, who resides in Bermuda. She is an unbelievable fisher lady with a style all her own. 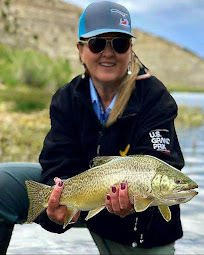 She presented this picture in a recent post telling us of how not to pose with fish and use photography tricks to make the fish look bigger. 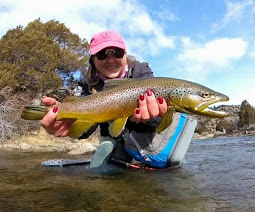 ﻿This fish was a very nice catch by Kathryn... it didn't need an embellishment in any way!! Kathryn agrees that this picture doesn't look natural because it is not to scale. Holding out your arms way out to get that eye of the fish into the camera isn't the way to go. Some people go to the fish-eye lens on a camera to make the front of the fish stick out in the picture. But, the way I see it (and I believe Kathryn believes) is that if you have a big enough fish, you don't need to exaggerate it in a picture. Just ask Mike (Troutrageous) if we found the "BIG FISH"!! 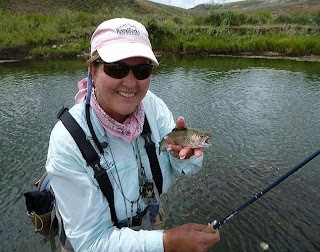 Nope, a Wyoming trip of many small fish. 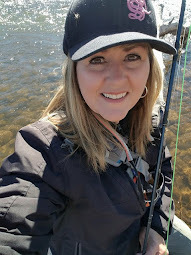 So, let's get back to just creating great memories when we go out to fish, shall we? Pictures should show a smile on an anglers face...rule #1!!! I catch mostly 12-14 in fish on an average and I catch a few under ten inches from time to time. 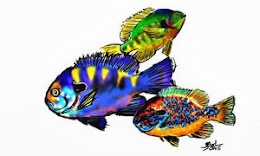 I'm not concerned whether that fish gets up front and center amongst the other BIG catches on Facebook or the blogwaves. Sure, when I get a biggun', you are going to see the dang fish, right here on this blog. But, it won't be extended out. It might even still be in the net. (Because I have a knack of losing my big fish after it gets into my hands) Ha! In my estimations, most of us catch that one-time BIG guy once a year! Yeah, my fish pictures aren't the biggest or baddest... but, do I really look like I'm at all concerned about it??? Nooooo... I am on the biggest adventure of my life! Going to places that are beautiful. Meeting great people along the way. And catching fish. all my fish are over 20 so i don't have to worry about embellishing them. RD you know the size of the fish I love. Great bunch of photos. Big or small, anyday on the river is a good day. Joel ~ No matter what size or species you find along the way, being outdoors is the best part of it all...That's for sure! same day, same topic! 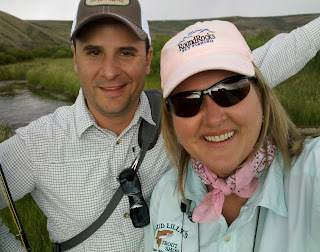 Great minds River Damsel! Trutta ~ Glad to have you on board this morning... I just went over to your story and you are thinking about the same thing for sure!! Even halfway across the world. Where you live greatly determines the size of fish you catch. I think great anglers catch fish in all places and conditions. 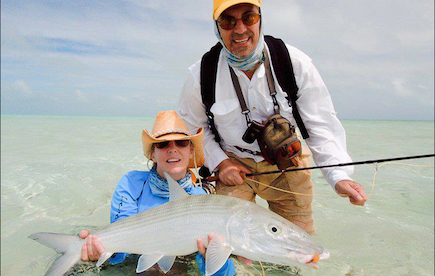 Fishing shouldn't be just about catching big fish. If that's all you think it is you're missing out. Thanks, Kevin. 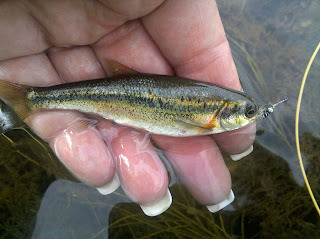 Of course it's fun to catch the big one, but variety plays a very big part in my fishing. And some of those small fries in the small streams can be very beautiful. I am fortunate to be able to go to big rivers and small streams. I love it! You know Emily, it's nice to catch a big one now and then, but catching 10 or 20 little ones is a lot more fun. Can't wait for General Trout Season to open at the end of April and get back on those small streams. Mark ~ I thought that you had year round fishing out there! You must be waiting for the hills to defrost... Very good. Yes, spring is near... hooray! Yes we do, but most of the creeks fall under the general regulations where the lakes are open all year. All of my fish are secret so no grip and grins. I catch a slough of 20's all day long (we're talking centimeters right?). Some people are born to brag, and it's just not me. Others just get out and enjoy it. Clearly the latter describes you. You happen to catch nice fish too (like in your last photo above....nice smile both of your faces too). Keep doing what you do Emily.